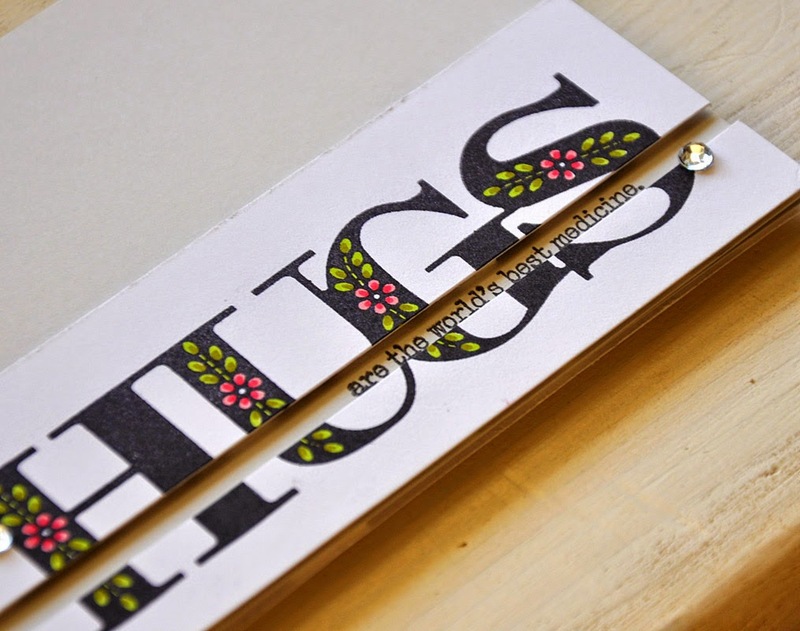 Sentiments can be handled a number of different ways....stamped, embossed, written by hand. These are just a few of the basics treatments. In today's tip I've put sentiments to the test! My treatment towards them these days have been pretty rough. 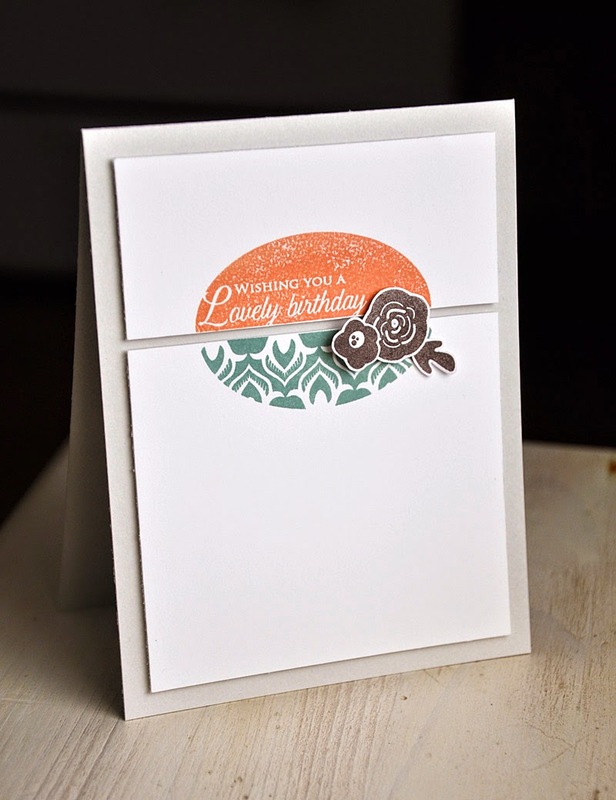 I love a good sentiment strip or two, but I love it even more when I can add a sentiment strip to a simple card in an unexpected way. I take a good look at the phrases included in a stamp set. Any with fun flourishs, swashes, shapes, extended ascenders or descenders, multiple lines of text and such get me thinking. These type are perfect for the butcher block! Or the blade of my paper cutter for that matter, to chop them in two. Here's a fun round sentiment with a deep descender featured in the capital F of "Feel". 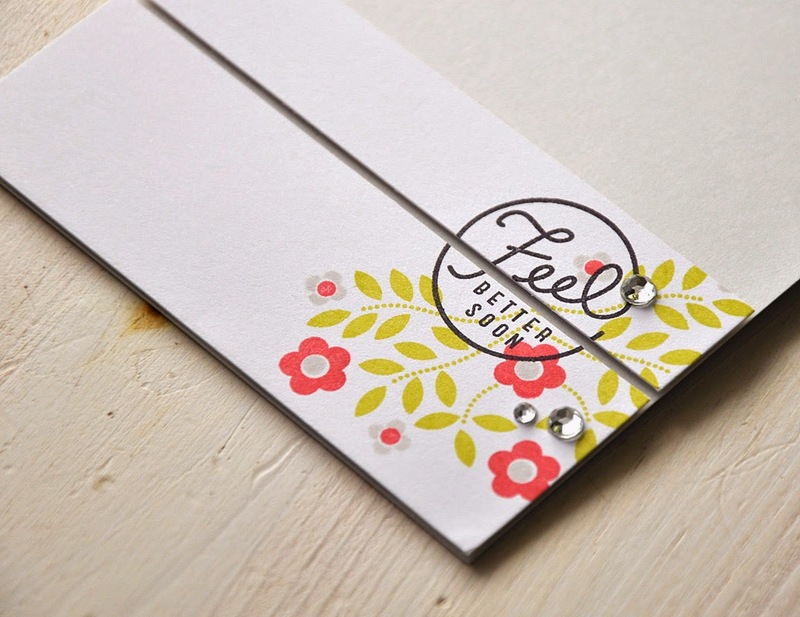 After stamping the floral images over the sentiment, I hacked that baby into two strips and attached the two pieces leaving a slight gap. It adds just a touch of the unexpected. I could have left things alone and kept the stamped panel in one piece, but it just wouldn't have made much of an impact to the design. 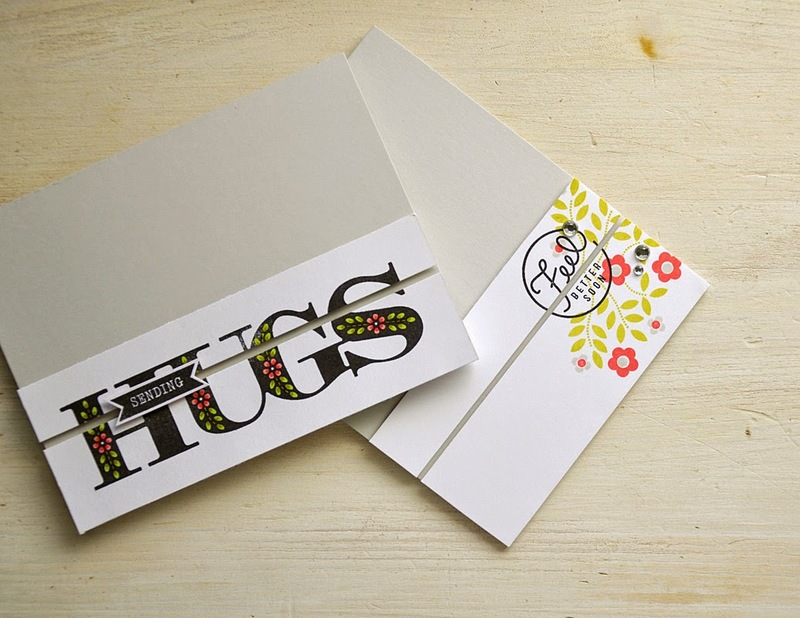 Both the sentiment and floral images are from the Cuppa Love stamp set. 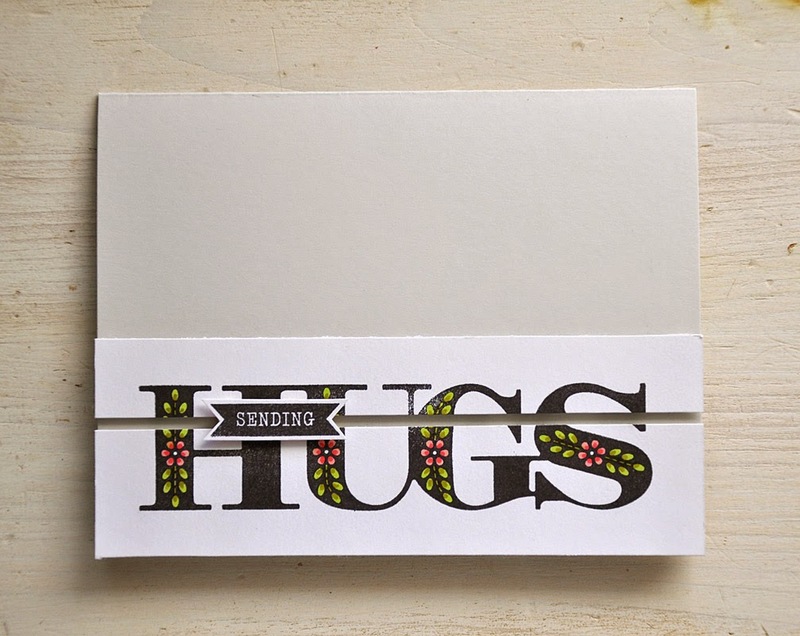 Large and bold sentiments are great for this technique too! Usually they are big enough to not be effected by the slicing and are still legible. A touch of color using a few Copic markers, inspired by Laura's card. Here's a second take on the card above. These large sentiments are very versatile! 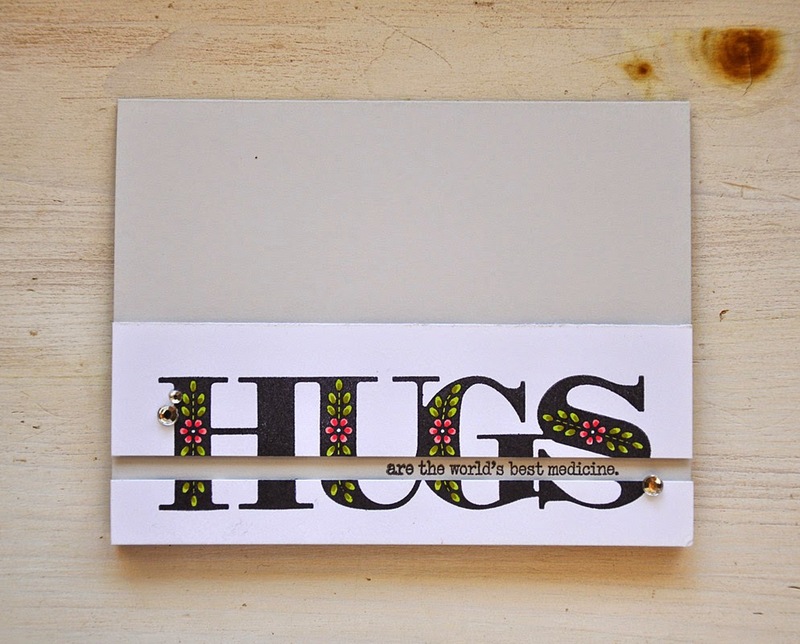 This one is from the Big Hugs stamp set. 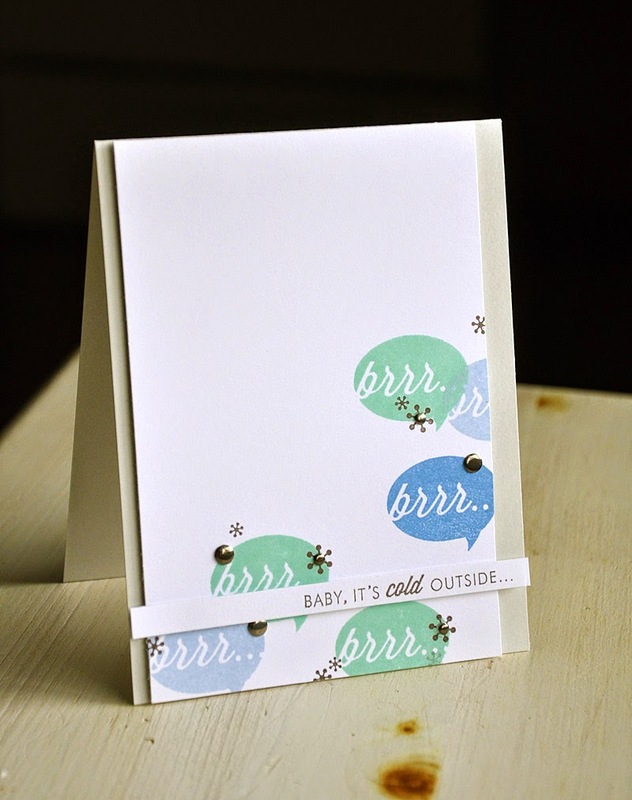 For more sentiment treatment ideas check out these blog posts... first and second cards here and last card here. So what do you think?! Might you take a second look at your sentiments? I sure do hope so! Well, that's it from me today. 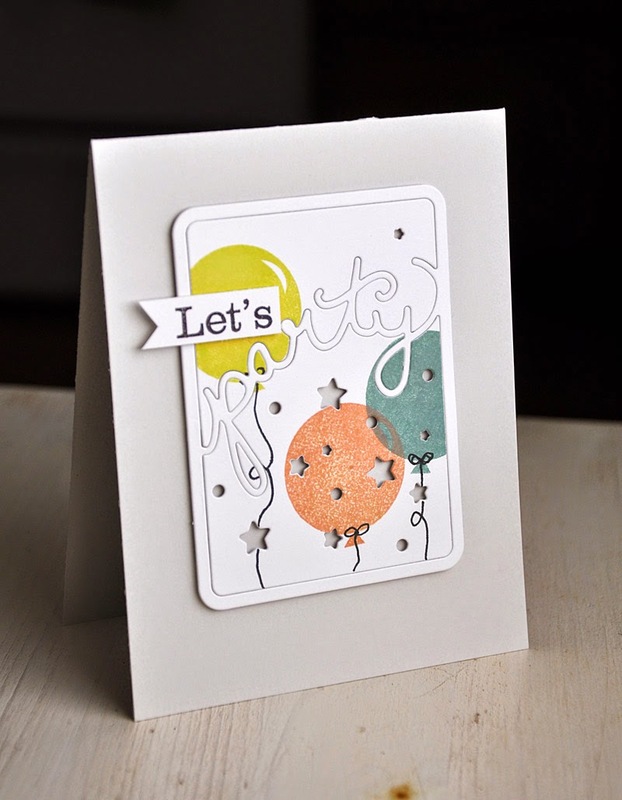 2015 Birthday Tags by Dawn McVey. 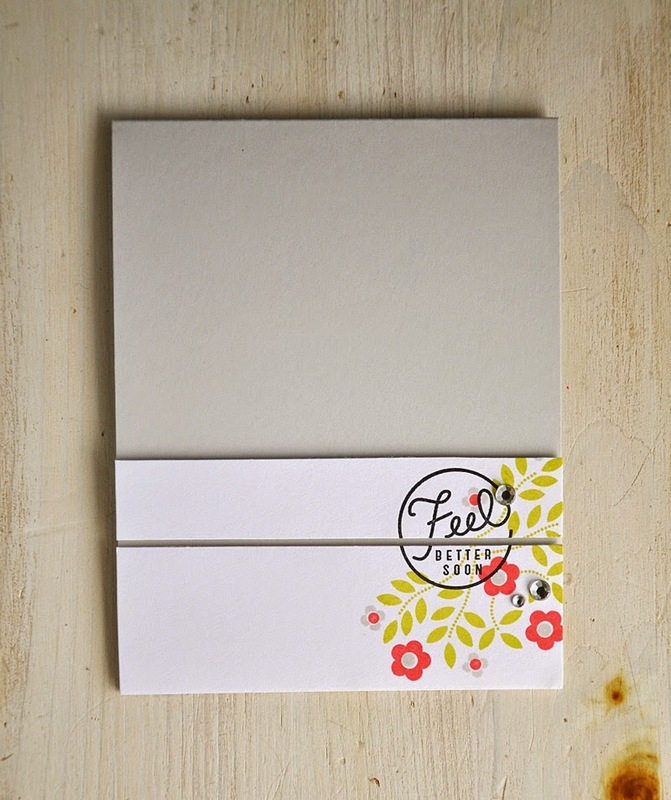 Paired with the previously released Mini Blooms stamp set. Phrase Play #12 by Nichole Heady. 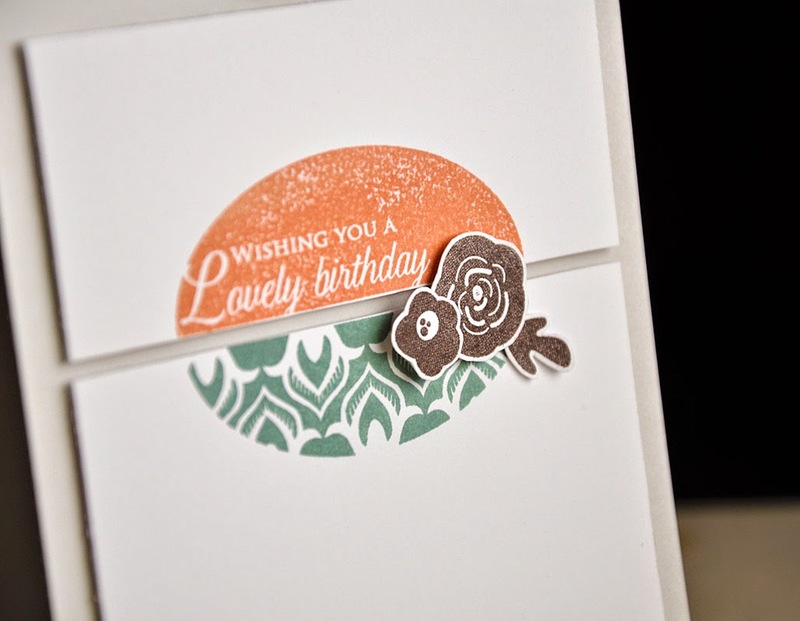 Paired with previously released Birthday Style stamp set. 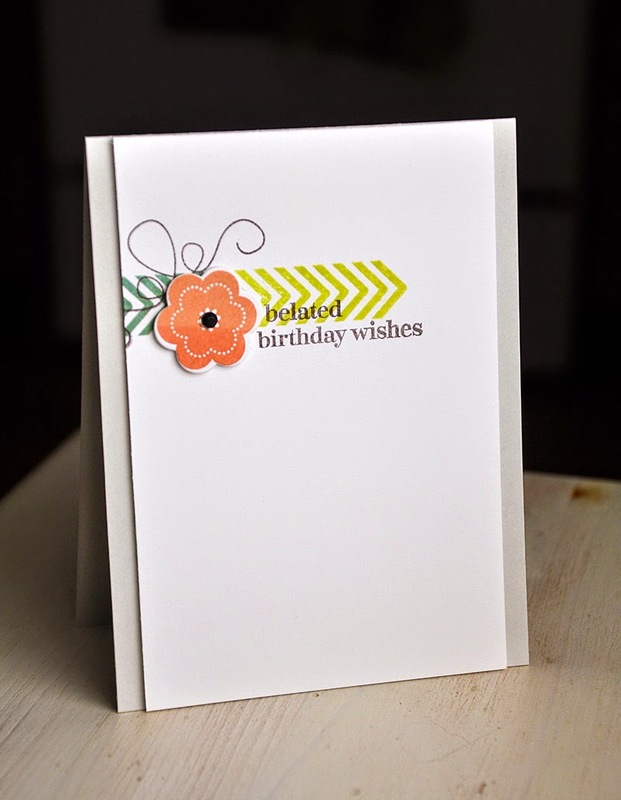 Happy Notes by Melissa Bickford, Keep It Simple: Belated Birthday by Nichole Heady and Stitched Swirls by Erin Lincoln. Cable Gram by Dawn McVey. Welcome to the final day of the Papertrey Ink January countdown. 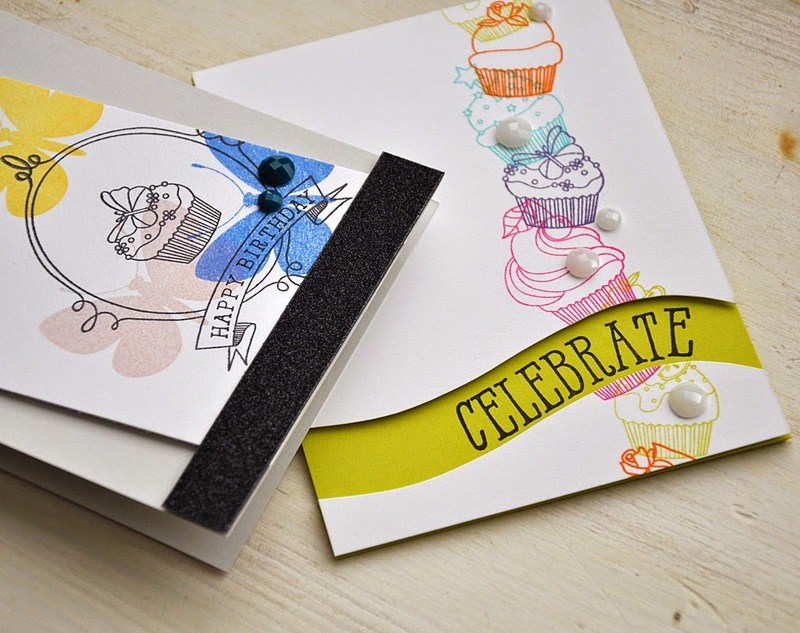 Today's post is all about the the new Baker's Dozen stamp set. What a sweet set! It's been such a pleasure to work with this delightful set. 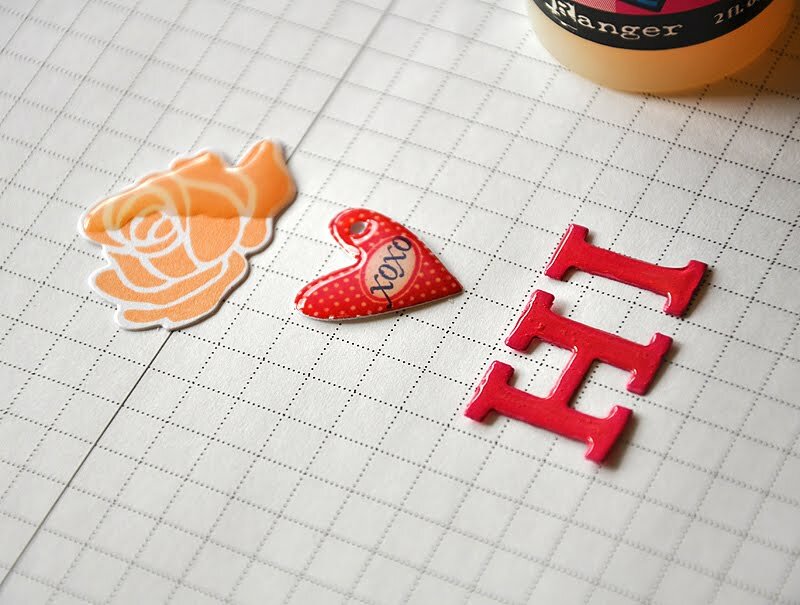 With its many possibilities and adorable images, a stamp set doesn't get any sweeter than this! The Baker's Dozen is a collection of thirteen cupcake images, one for each month of the year plus a versatile extra! 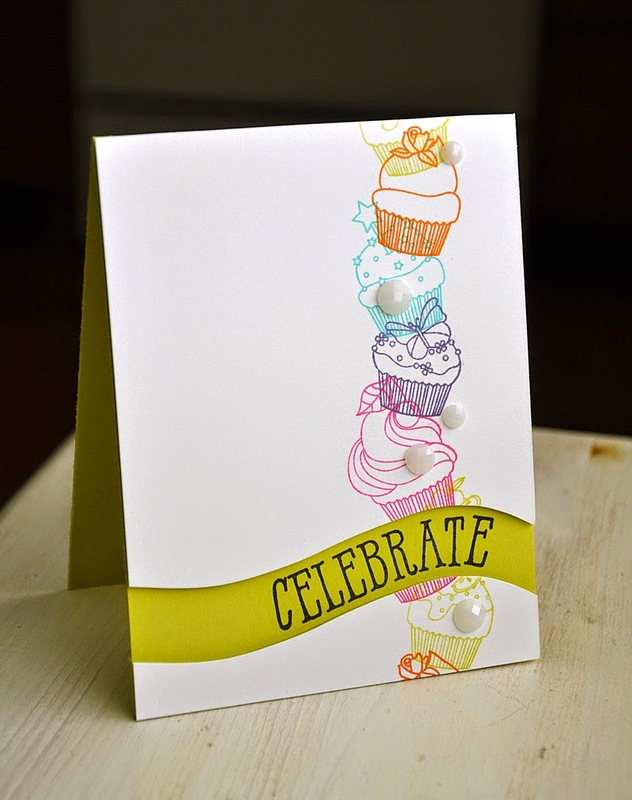 Here's a birthday card featuring the March cupcake. 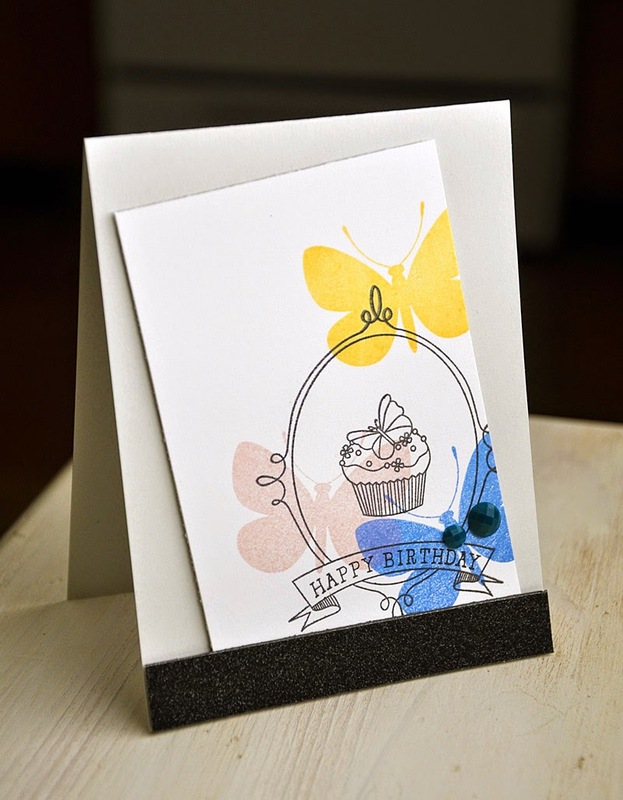 I paired it with the previously released Beautiful Butterflies stamp set. I stamped a beautiful butterflies backdrop for the pretty cupcake and frame in a color combo of blueberry sky, sweet blush and harvest gold. 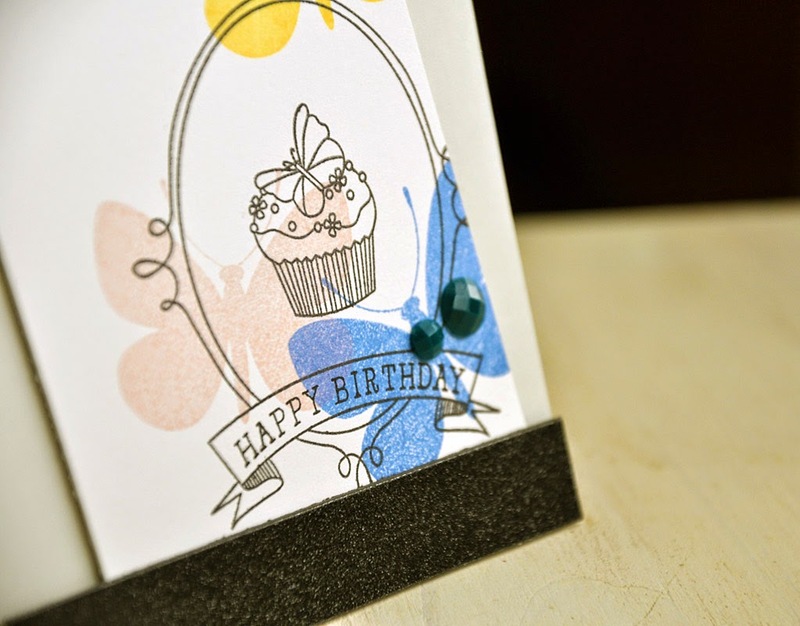 I then attached black glitter tape along the bottom edge and finished the card off with a couple large gems. This one is for celebrating a birthday, no matter the month. A fun selection of cupcakes were stamped one on top of the other in a colorful combo of raspberry fizz, plum pudding, hawaiian shores, orange zest and limeade ice. 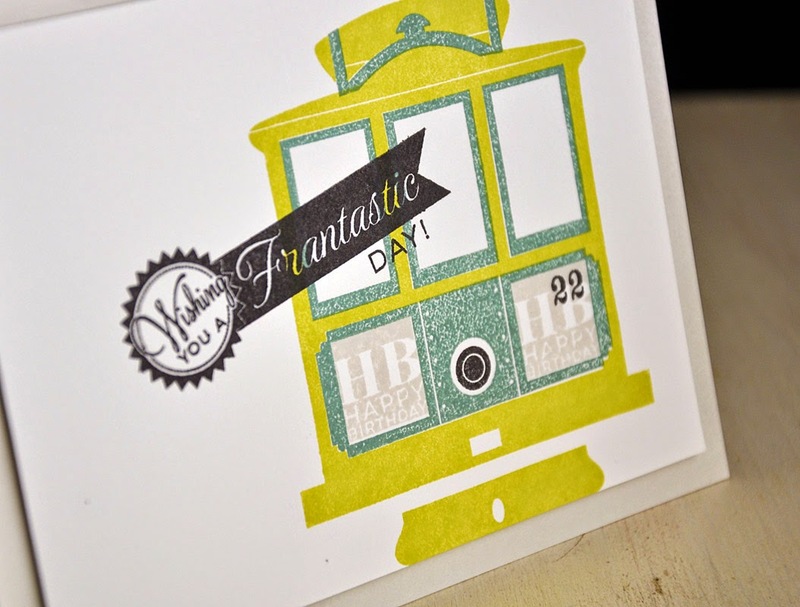 The stamped panel was trimmed apart by hand to fit the sentiment (from the soon to be release Layered Banner Banter stamp set) perfectly, revealing the limeade ice card base below. 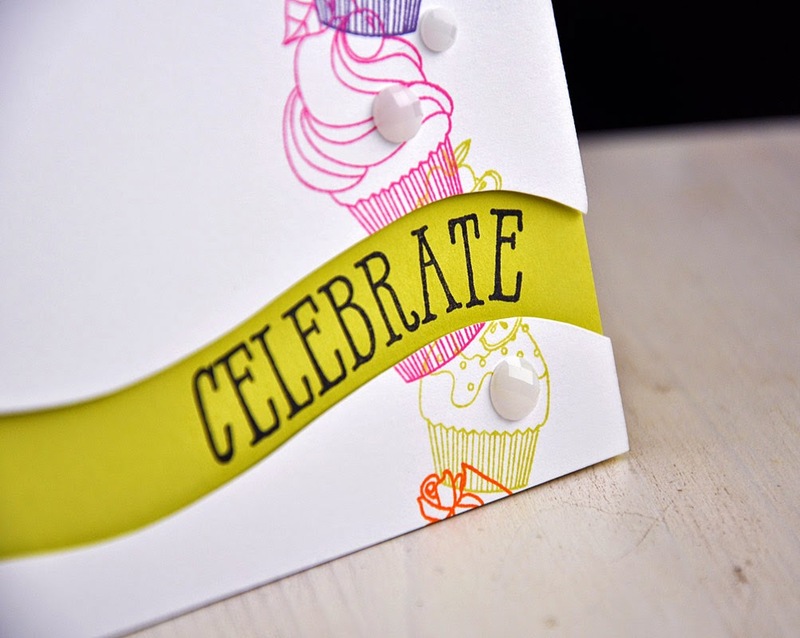 Here's How: First, create a template by stamping celebrate and trimming a curve by hand that follows the bottom edge of the sentiment. Trace the template edge onto the desired spot, trim and erase. It could't be easier! Well, that's all I've got for you today. Just remember... everything you've seen peek of today will be available for purchase through Papertrey Ink, beginning January 15th. 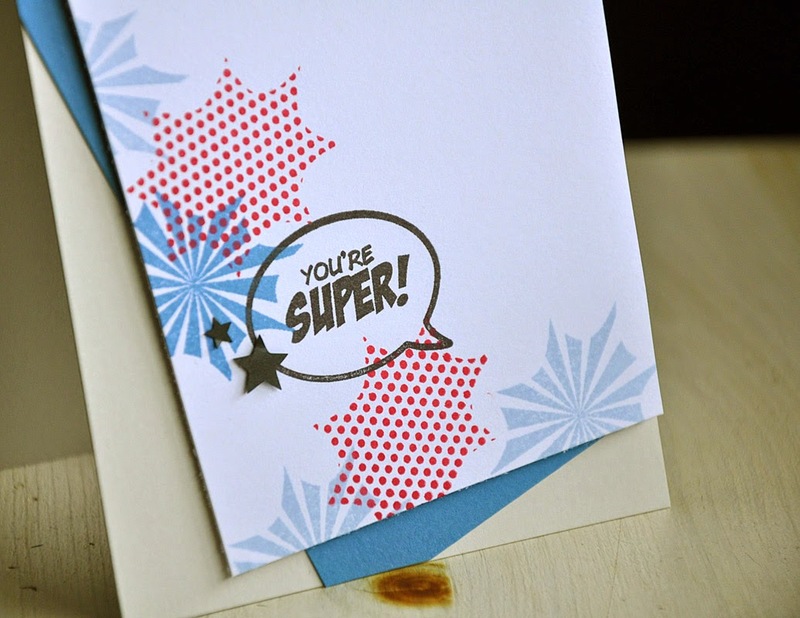 Hello and welcome to the fourth day of the Papertrey Ink January countdown! First up, Secret Agent. 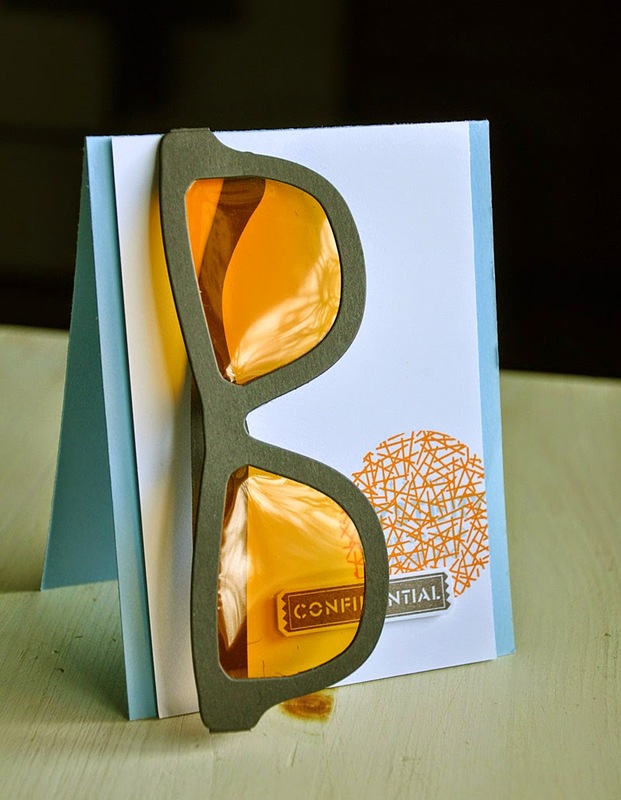 My focus for this first card are the cool shades. 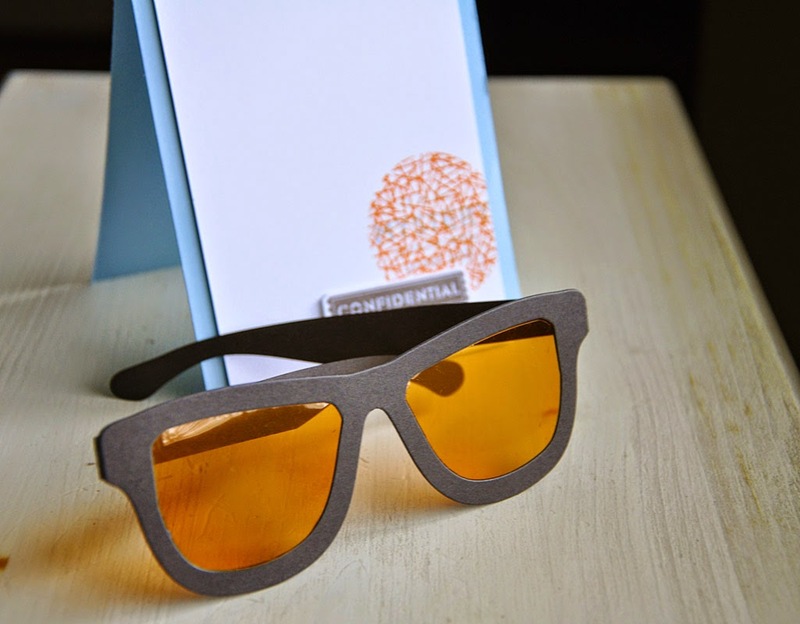 These are not your typical glasses. In fact, you can't read the message on this card without them. I've tucked an arm behind the top layer so they're easily accessible. Here's How: All I did was leave a space between the dimensional adhesive I've attached to the backside, these sweet shades slide right in from the top. Another idea would be to cut a slit, wide enough to allow one arm to side on through, at the top edge of your card base. 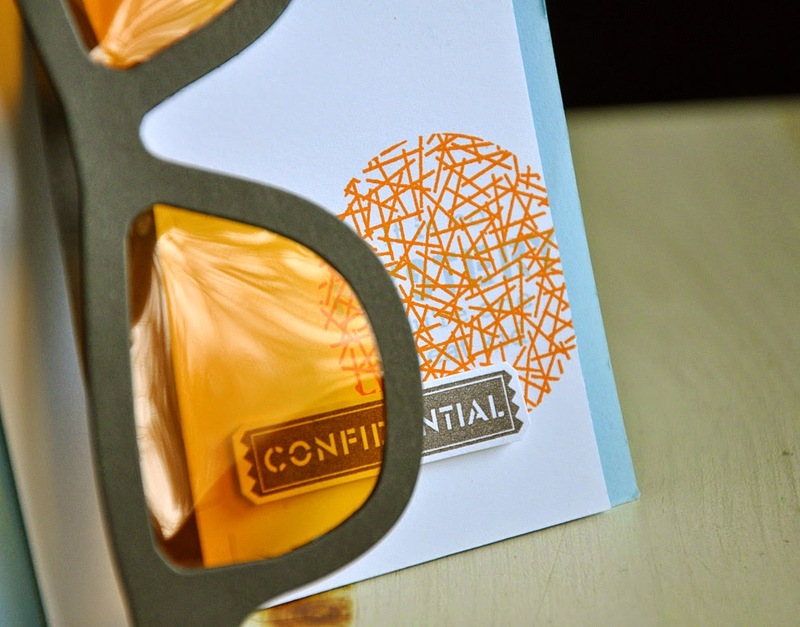 This undercover card was stamped in a color combo of spring rain, orange zest and smokey shadow. Here's a look at Zappy Birthday in action! I combined this set with the Tipped Top die collection. 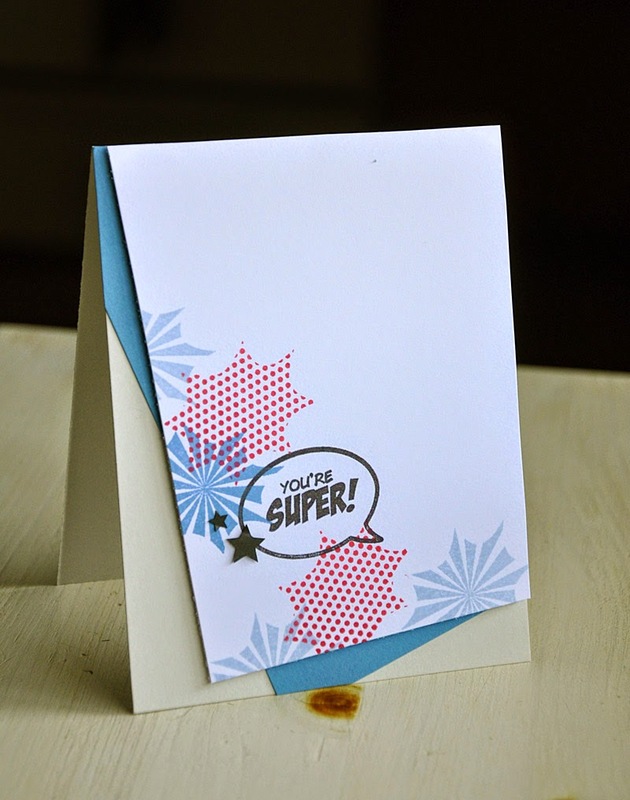 These dies helped me create a sort of a "sneak peek" at a hidden superhero cape underneath the top layer. A mix of patterns, colors and shapes keeps things exciting. Colors used... blueberry sky, pure poppy, spring rain and true black. Well, that concludes my look at the Secret Agent and Zappy Birthday collections. 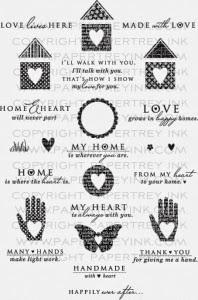 Just remember... these products will be available for purchase through Papertrey Ink, beginning January 15th. Hi there! 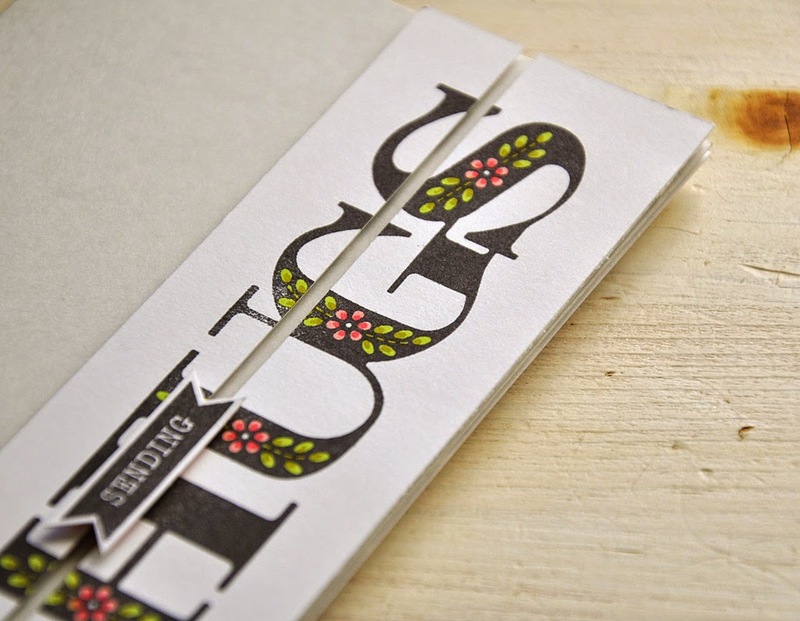 Welcome to day three of the January Papertrey Ink countdown. I'm joining the design team today in sharing sneak peeks of the new Monthly Moments: January. This set could be no more perfect for this blustery month. Although, around my neck of the woods, January has been quite warm. 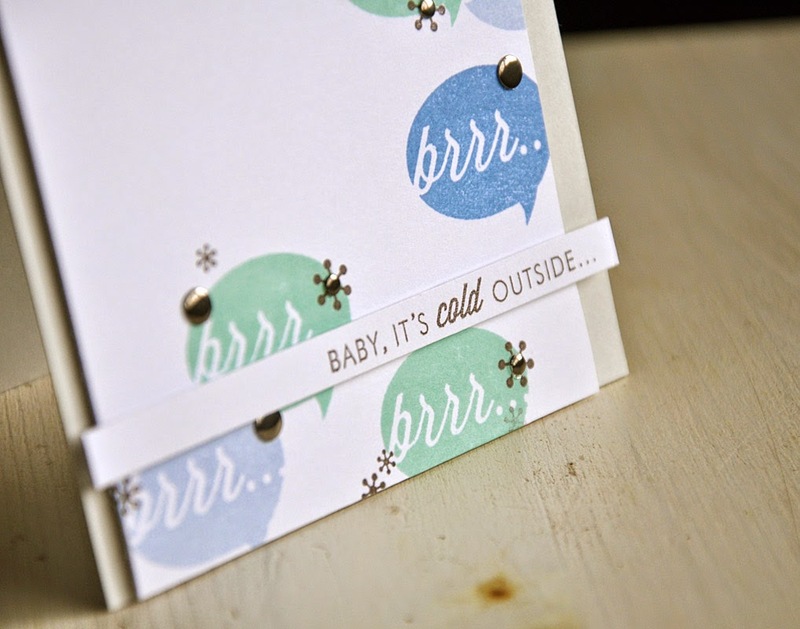 I still had fun creating a sweet card perfect for warming someone's heart up on any chilly day. I stamped a fun random background (using the bubble from this months set) following this simple pattern/order... 3 in aqua mist, 2 in spring rain and 1 in blueberry sky (since this is darkest color). Maybe not the most random background, but a bit of orderly chaos makes me happy. 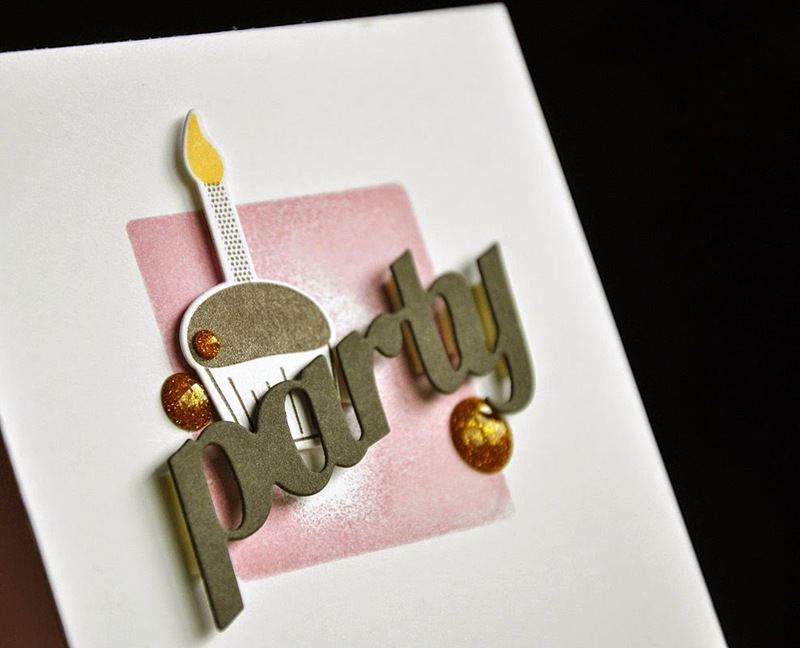 I then finished the card off with a fitting sentiment and a few metallic embellishments. Well, that concludes today's look at Monthly Moments: January. 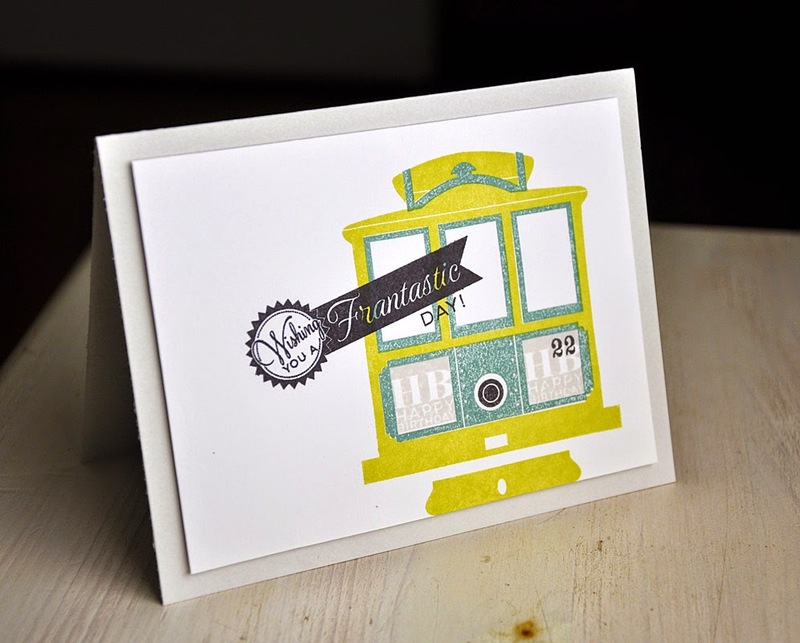 Just remember... this set will be available for purchase through Papertrey Ink, beginning January 15th. Hi there! Welcome to day two of the January Papertrey Ink countdown. 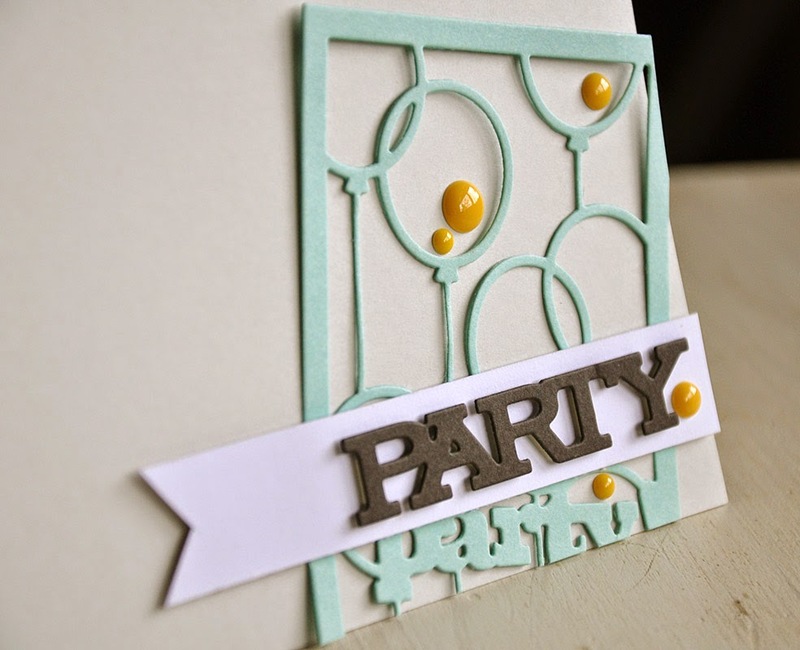 First up the Text Block: Party Time die. This stunning die has so many possiblites! It would be so pretty layered with colored vellum, made into a shaker element, copic or water coloring underneath the frame and of course, so much more! 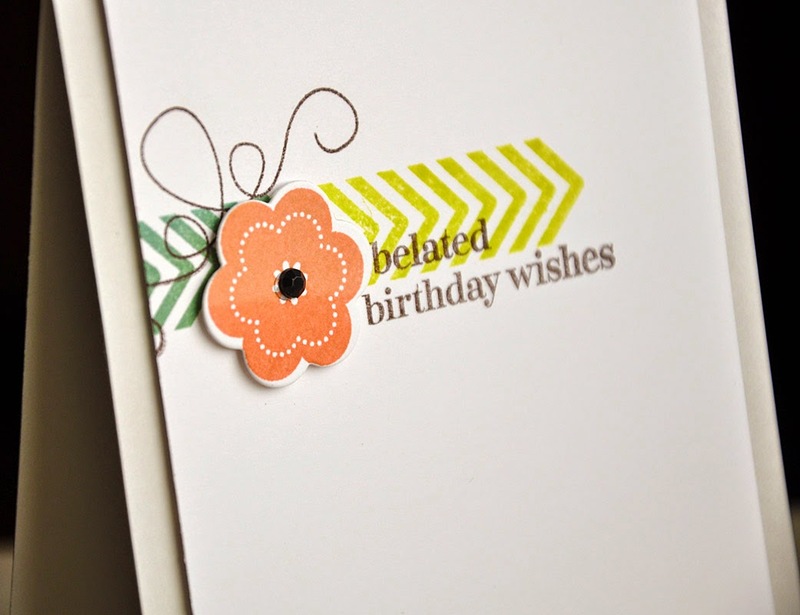 Turn it into a tag or feature it on a card! I chose to go with a simple, but bold look. 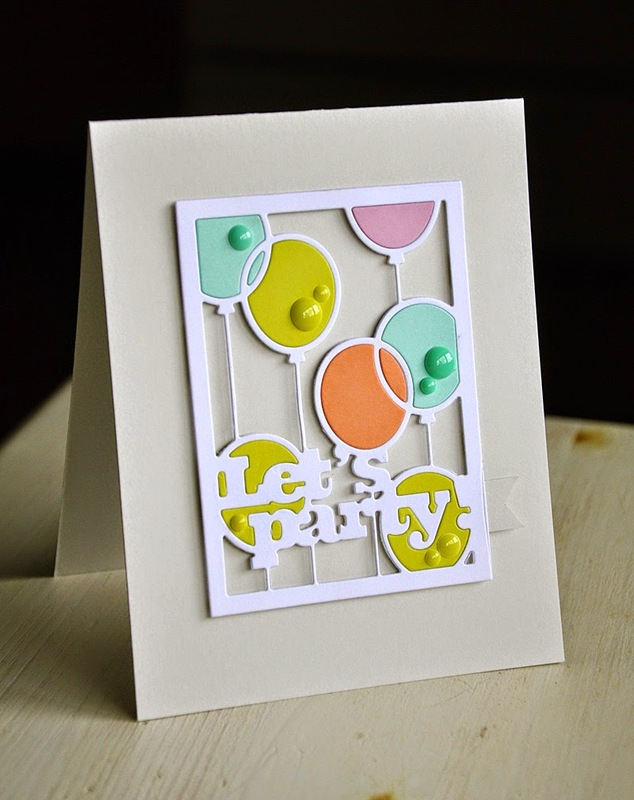 Keeping the overall design neutral so that the bright balloons would stand out. 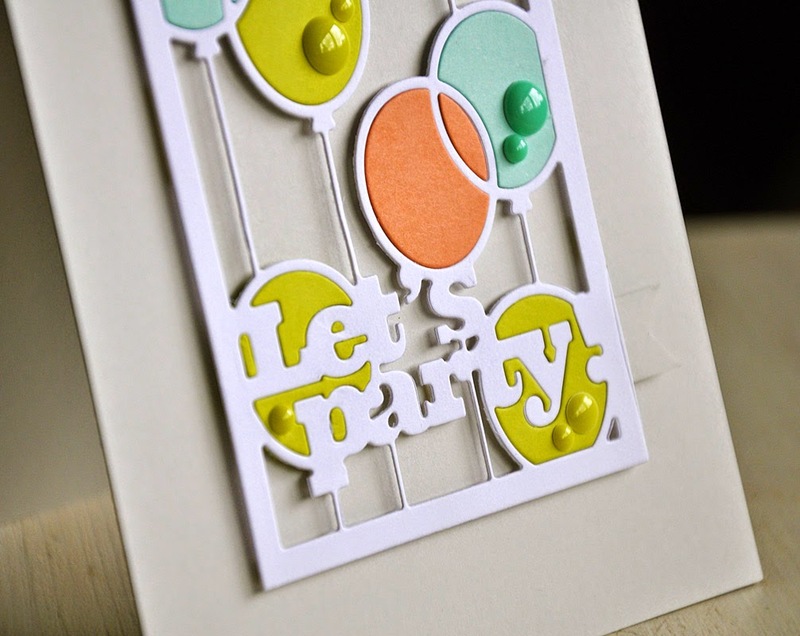 I had to die cut the Text Block: Party Time die from white, limeade ice, aqua mist, melon berry and lavender moon cardstock to achieve this look. 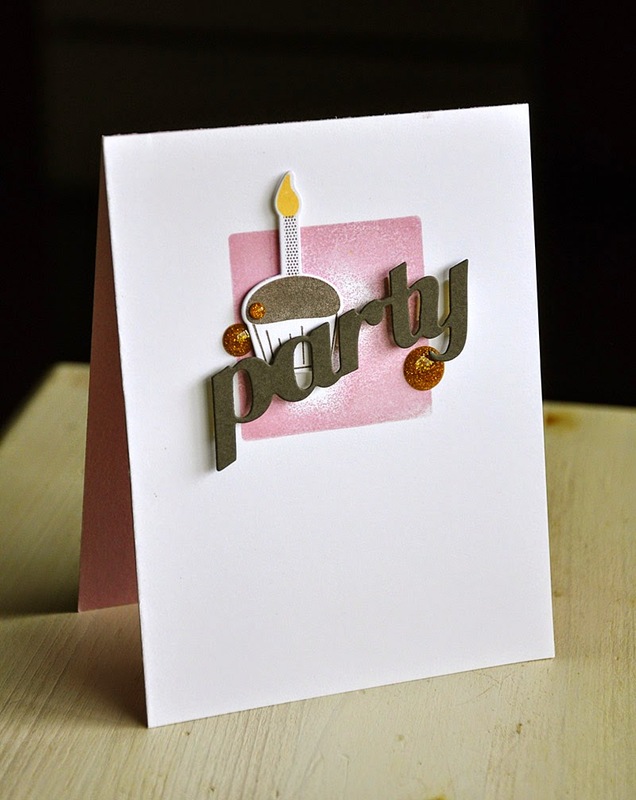 My second card features both Text Block: Party Time die and the Party Trio dies. I die cut the text block from aqua mist cardstock and rotated it onto its side and trimmed off the excess, keeping the balloons intact. 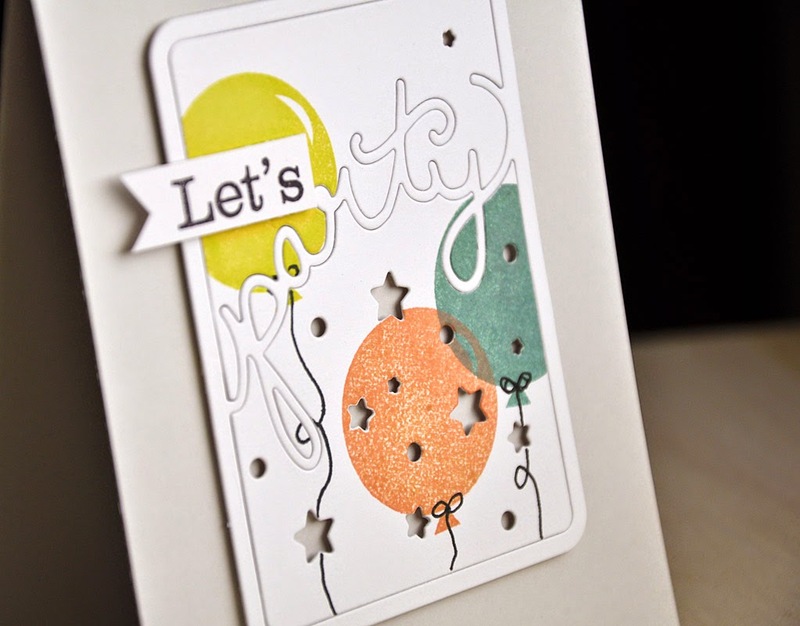 Attached a party strip and embellished with a few enamel dots. 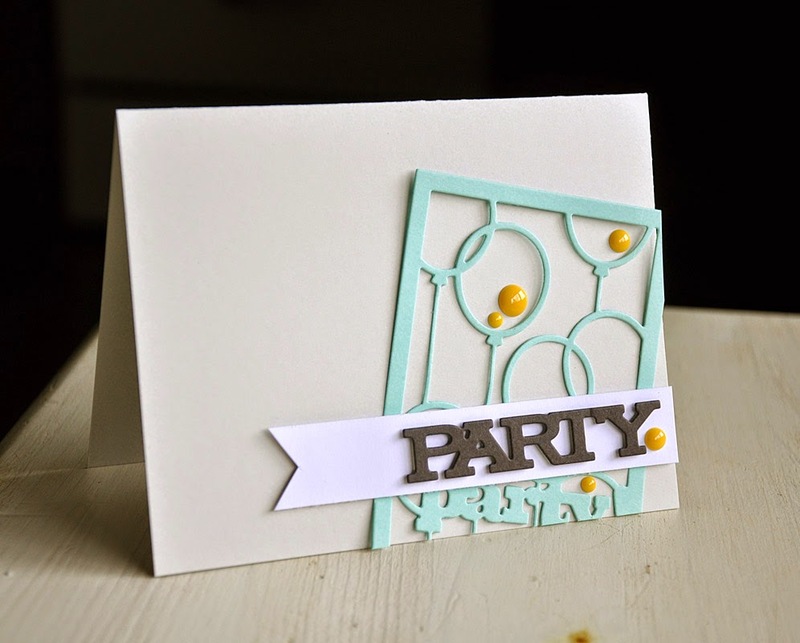 This Party Trio die was die cut from smokey shadow cardstock. Here I've paired one of the Party Trio dies with another new item from this months release... Hey, Cupcake!. There is a square stamp image featured in this new stamp set and I used the backside of it for my lavender moon square. I'm quite pleased with the faded center, where the stamp did not impress all the way. Looks sort of like I planned it that way when actually, I didn't. A happy accident. Well, that concludes today's look at Text Block: Party Time die and the Party Trio dies. Just remember... all that you have seen today will be available for purchase through Papertrey Ink, beginning January 15th. First things first... Happy New Year!!! Thanks for joining me today for the January Papertrey Ink Senior DT Challenge. This time around we are bringing back Love Lives Here! This oldie is definitely a good one! I loved bring out this beloved set and using it in a new way. 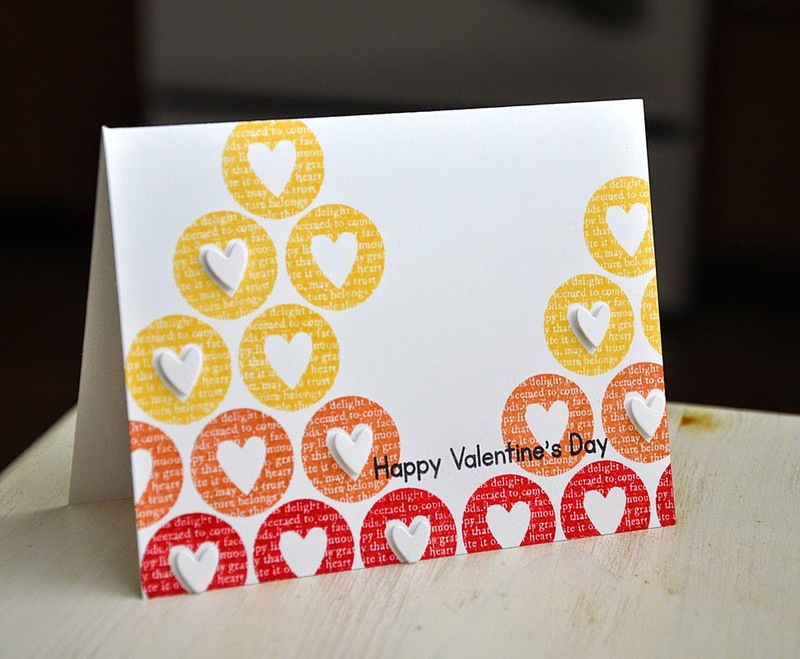 Using the heart circular image, I stamped a sort of ombre randomly placed pattern using these ink colors... pure poppy, melon berry and harvest gold. 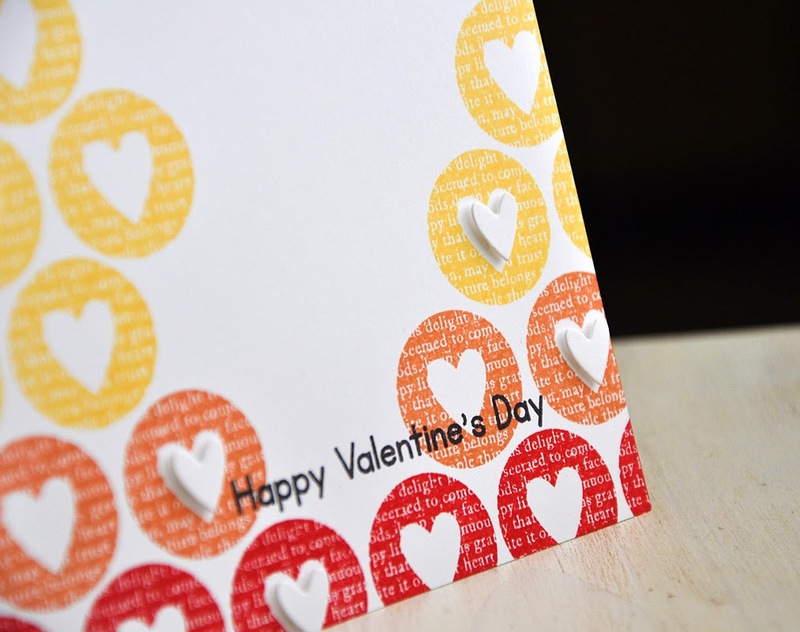 I drew attention to the negative hearts with a the addition of die cut white hearts popped up with dimensional adhesive. It's a simple way to take this card up a notch.